Faces of the World's goal is to preserve and celebrate the diversity of the world's people through art education, cultural exchange and embracing tolerance. Over the past 6 years, Faces of the World has teamed up with volunteers/interpreters to teach Portrait Workshops to over 7,000 children throughout the world and United States. These Workshops teach students to celebrate their unique and valuable cultureâ€”instilling pride, self worth and acceptance of others. Their hope is to inspire a new generation to become curious and accepting towards the amazing cultural diversity of the world as well as themselves. 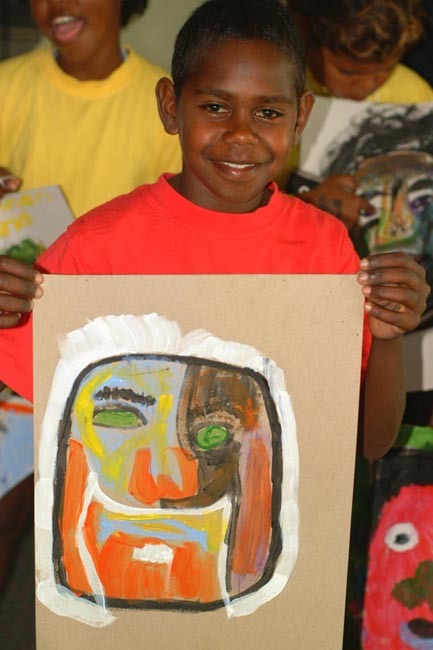 Whenever possible, Faces of the World also presents World Portraits Exhibits that feature original paintings created by Stephen Bennett along with the colorful art created by the children during their Portrait Workshops. These dynamic and personal expressions further promote cultural exchange, create tolerance towards all peoples and make lasting records. Today, these cultures are vanishing at unprecedented rate, so capturing their essence now is critically important. "I know that to try to capture and penetrate the Polynesian soul, one must above all love that which is human. Such is the case with Stephen Bennett."